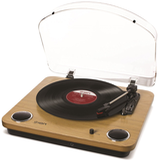 You are here: Home / Turntable Accessories / What’s the Best Record Player with Speakers? Got vinyl? 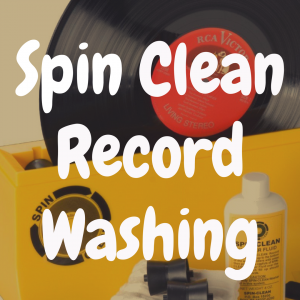 If you do – whether you bought the records yourself way back when or perhaps had them handed down to you – they’re not doing anybody any good just sitting there in their sleeves. Of course, you’ll need something to play them on, and the good news is that there’s absolutely no need to spend an arm and a leg on a full stereo system (receiver, turntable, speakers) in order to casually spin the platter. 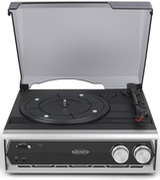 If you’re not obsessed with audiophile-quality sound and are interested more in a quick and low-cost way to play or duplicate those records, the answer lies in a basic record player with speakers. And a decent (or even better than decent) unit can be had in today’s marketplace for less than $200 – sometimes considerably less. 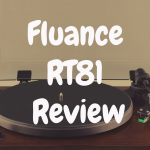 In this article, we’re going to dig into the pros and cons of owning a record player with built-in speakers, and then we’ll break down a small handful of these turntables that we think are actually worth owning. 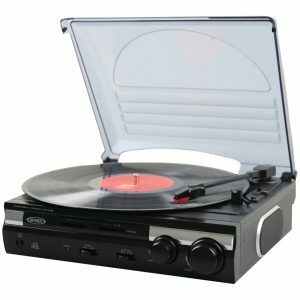 The reason that such inexpensive record players exist is that the process of playing an LP is an extremely simple one that hasn’t changed much at all since the dawn of recorded sound. Computer technology has evolved, digital sound has become the norm, but a needle on a record is still just that. A round platter sits on a base (also called a plinth), and a motor rotates it at a constant speed – 33⅓, 45 or 78 RPM (revolutions per minute). 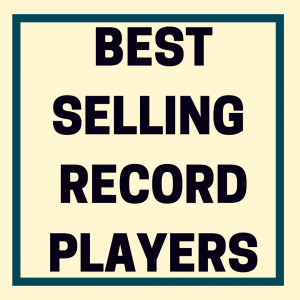 The slowest speed is for the so-called “long playing” vinyl record or LP, the 12-inch variety. Forty-five is for those records called “singles” (the ones with the large hole in the middle). The fastest speed is for old-style (and extremely fragile) shellac recordings. A needle (called a stylus) is mounted on a cartridge, which in turn is connected to an arm (aka tonearm). When the record turns, the arm moves along the record grooves, and the vibrations from the grooves are electronically amplified and translated into audible sound. Most self-contained units are belt-driven rather than direct-drive (a generally less-expensive process) and are fully or almost fully automatic, meaning that there is minimal need for the user to touch or manipulate the tone arm. The advantages of buying an all-in one unit are plenty. 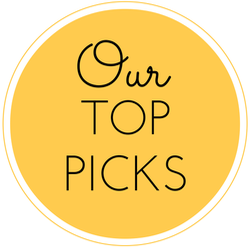 They tend to be very inexpensive, and you really don’t need anything beyond what they come with to get them up an running. They are also lightweight, and many are extremely portable. 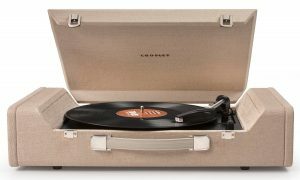 In fact, some of the popular retro-look Crosley record players are actually designed to look like suitcases. This is kind of reminiscent of the old “sock hop” days of the nifty ‘50s when people carted their records and players around to friends’ houses so they’d be ready to Bunny Hop at a moment’s notice. There’s also digital conversion to be considered. A self-contained unit that contains a phono preamplifier and hooks up to a Mac or PC might be the perfect vehicle for turning your favorite album tracks into MP3 files, which can then be burned onto CD or DVD or loaded into a phone, iPod or similar device. Most self-contained machines are designed for portability and convenience, not the highest of fidelity. They tend to have tiny (and correspondingly tinny) speakers that, because of the inalterable laws of physics, simply can’t play that loudly without some distortion or reproduce low bass notes. Also, there’s every chance that the speed won’t be 100 percent consistent, and that, with careful listening, you’ll notice little “hiccups” in the sound, technically known as wow and flutter. Finally, with few exceptions, the all-in-ones aren’t adjustable or upgradable. 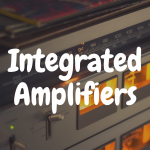 You may have the option of hooking them up to better speakers or to an actual receiver, but the arm, cartridge and other parts are there for good. They can be replaced but not upgraded. What you hear is what you will always get. 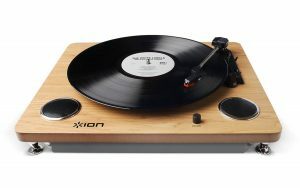 1) ION Audio has quickly vaulted into the top echelons of the turntable market and has a long line of affordable players, including units with speakers. 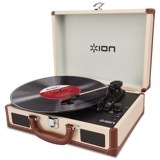 We were really taken by the model called Ion Audio Archive LP, if for no other reasons than its rich, natural-wood finish. It plays all three record speeds, and, based on its name, seems specifically designed for conversion. It easily connects to a computer, and software is included. There are also RCA connectors to mate the unit to a regular receiver. The bad news? The tiny speakers, mounted on top and inside the plinth are more appropriate for monitoring the transfer than serious listening. There’s also no dust cover. 2) The ever-expanding Crosley line gets a nod here for its Crosley Nomad. It has the most sophisticated cartridge and stylus of the bunch. 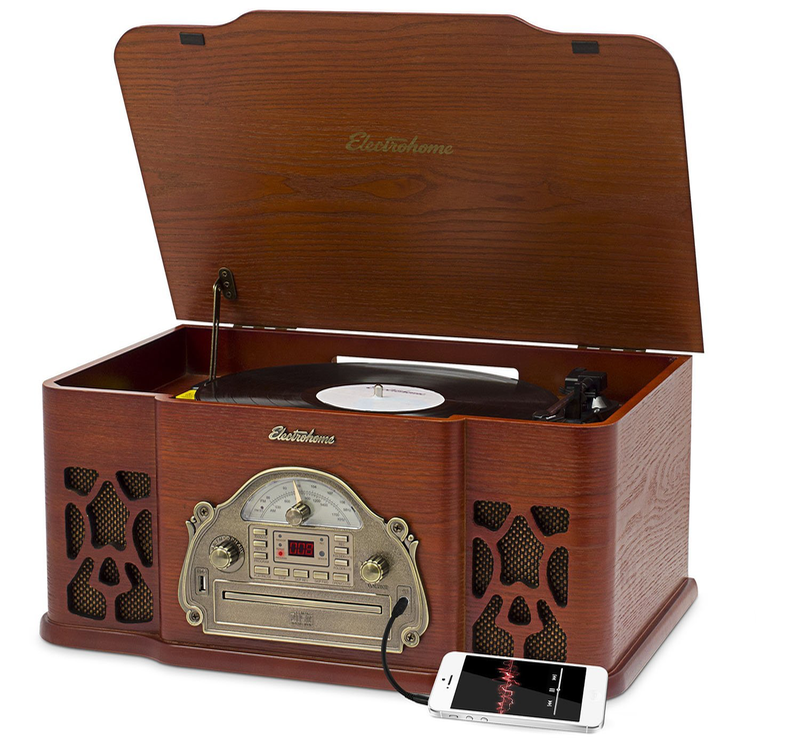 Brown vinyl-wrapped and sporting a “midcentury look,” this all-in-one three-speed portable has fairly sizable side-mounted speakers that do a most credible job of playing music. This unit also works for MP3 dubbing, and a software suite is included too. It can be connected to a receiver as well. At 10 ½ pounds, it feels sturdy and well-made and just might be the most reliable of our bunch. The headphone jack is a nice little bonus. The player snaps closed for easy transportation. 3) What could be more “retro” than a product named Studebaker? Of course, the Spectra Studebaker has nothing to do with the long-defunct automaker. 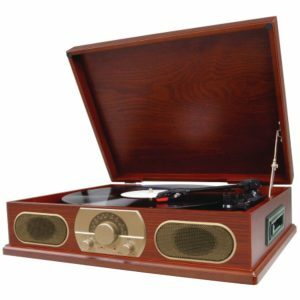 But based on looks alone, a lot of people would go for this one immediately because it has a luscious wood veneer and a tasty, old-time radio look about it. And, for the feature-conscious, it does (as its name indicates) have a radio and cassette player. But listeners beware: The platter and tonearm are plastic and, not surprisingly, the 2-inch speakers try hard, but they’re pretty much low-fi. However, the thing is beautiful to look at. 4) Considering both price and features, the Jensen (another longtime brand name brought back from the dead) JTA-230 3-Speed Stereo Turntable comes across as quite a little bargain (and we do mean little; this guy is small). It includes an AM-FM radio and connects to computer hardware for dubbing. Thankfully, a “bass boost” function makes its little speakers quite bearable. It even has a remote and LCD display. Sold only in black and quite utilitarian in overall appearance, it won’t win any awards in the looks department. It does have a dust cover. 5) The massive Electrohome EANOS502 is definitely a looker – it convincingly mimics an old-style console stereo from the ‘40s. But it’s just loaded with modern-day features, including a CD player (talk about a blending of the eras!). It also connects to receivers and allows for dubbing, as well. One unique feature is a jack to hook up phones and other musical devices. 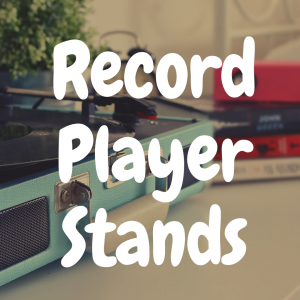 Its record-playing capabilities are quite a bit above average. Note that at almost 20 pounds, this one can’t be considered portable. 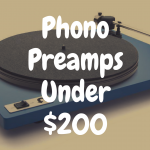 In an audio world in which it is possible to spend thousands of dollars on a turntable, the saner among us will take into account the law of diminishing returns. 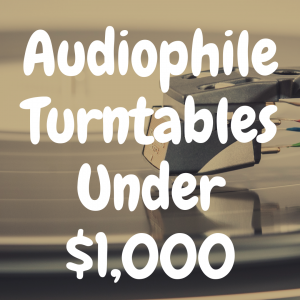 Applied to audio, it means that a $100,000 turntable doesn’t necessarily sound twice as good as one costing $50,000, and so on down the line. It all comes down to our experiences and expectations and, unavoidably, our pocketbooks. The bottom line is that you don’t need exotic materials, experimental techniques, and ultra-sophisticated equipment to bask in a tried-and-true technology that’s so very close to the way Edison envisioned it. If you just want to play a few records, and you’re not going to be overly fussy about the sound quality, then an all-in-one player might be perfect for you.